Lucy Lawless of Xena: Warrior Princess and Jeri Ryan of Star Trek Voyages in TV Guide's exclusive chat with these two wonder women. Lucy Lawless on the Contents page, plus a beautiful full-page photo of Jeri Ryan and a beautiful full-page photo of Lucy Lawless at the start of the article, both very nice and elegant. There are three small photos illustrating the article as well, one of Lucy Lawless with husband and daughter, and Jeri Ryan with her son. 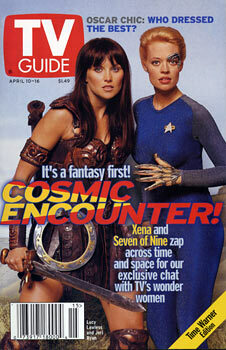 There's also a small photo of Lucy Lawless and Jeri Ryan together.